Keeps you signed in to the website even if you close your browser or shut down your computer, until you sign-out. A rich and fruity rustic cider bursting with apple flavour. Cloudy and medium sweet. Still cider. This is a fantastic collision between our crisp Somerset cider and our very own premium cola. It's smooth and very refreshing with hints of caramel complementing it's well balanced flavour. Contains caffeine. Sweet malt and floral lime aromas with a bittersweet blend of hops and fruit on the palate and a complex succulent fruity hop finish. Is this Your Local? Do You Know the Publican? Tell the publican you want to be kept up to date with real time news about their beers, latest offers, events, food menus and wine lists. When the pub subscribes we'll send you £10, cash! 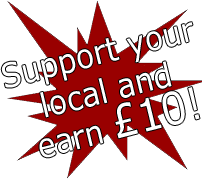 'Click to Earn £10' to continue and help your pub to connect. This pub is in our inventory but is not yet using the system. Get the pub connected so you can receive real time beer alerts by e-mail or SMS about what new beers are on the bar and allow you to be kept up to date with news about their latest offers, events, food menus and wine lists. Login to your account or register Now - It's FREE! An account already exists for this e-mail, woud you like to operate all accounts with one login?